Vilnius has a well-developed public transportation system. There are 78 bus and 18 trolleybus routes, the trolleybus network is one of the biggest in Europe. Over 451 buses and 292 trolleybuses operating in the streets transport about 589,000 passengers every workday. 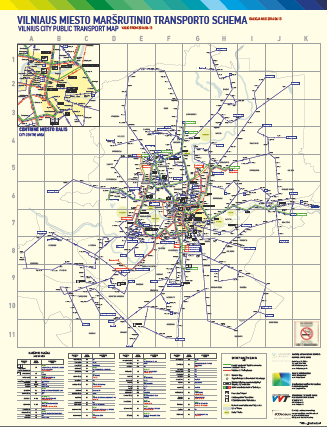 The length of bus network is 454 km and 66 km trolleybuses network (one way). The average speed is 22,81 km/h for buses and 16,04 km/h for trolleybuses. There are 1233 bus stops in the city, which all are equipped with information about schedule of transport operating in that area. A total of 40 scoreboards have been installed in the stops that have the highest passenger flow around Vilnius. Vilnius has one public municipal owned operator – one bus and trolleybus company “Vilniaus viešasis transportas”, Ltd. This company was established in November of 2011 from separated bus and trolleybus operators combined into one.